(New York, NY) Six-time Emmy Award winner Ryan Murphy (The Boys in the Band, “American Horror Story”) announced today on Instagram (@mrrpmurphy) that he will host a special performance of THE PROM, the critically acclaimed new original musical comedy, to benefit Hetrick Martin, GLAAD and The Trevor Project on Tuesday, April 9, 2019 at the Longacre Theatre (220 West 48thStreet). With direction and choreography by Tony Award winner Casey Nicholaw (Mean Girls, The Book of Mormon), a book by Tony Award winner Bob Martin (The Drowsy Chaperone) and four-time Tony Award nominee Chad Beguelin (Aladdin), music by Tony Award nominee Matthew Sklar (Elf) and lyrics by four-time Tony Award nominee Chad Beguelin, THE PROM began performances on Tuesday, October 23, 2018 and officially opened to rave reviews on Thursday, November 15 at the Longacre Theatre (220 West 48thStreet). THE PROM stars Tony Award Nominee Brooks Ashmanskas (Something Rotten! ), Tony Award Winner Beth Leavel (The Drowsy Chaperone), two-time Tony Award Nominee Christopher Sieber (Shrek the Musical), Caitlin Kinnunen (Bridges of Madison County),Isabelle McCalla (Aladdin), Michael Potts (The Iceman Cometh), Angie Schworer (The Producers), Courtenay Collins (Broadway Debut) and Josh Lamon (Groundhog Day) and an ensemble that includes Mary Antonini (Jesus Christ Superstar), Courtney Balan (Falsettos), Gabi Campo (Broadway Debut), Jerusha Cavazos (Broadway Debut), Shelby Finnie (Broadway Debut), Josh Franklin (Anything Goes), Fernell Hogan (Broadway Debut), Joomin Hwang (Broadway Debut), Sheldon Henry (Broadway Debut), David Josefsberg (Waitress), Becca Lee (Broadway Debut), Wayne Mackins (Broadway Debut), Kate Marilley (My Fair Lady), Vasthy Mompoint (SpongeBob SquarePants) Anthony Norman (Broadway Debut), Drew Redington (Holiday Inn), Jack Sippel (Broadway Debut), Teddy Toye (Lysistrata Jones), Kalyn West (Broadway Debut) and Brittany Zeinstra (Broadway Debut). THE PROM features scenic design by Tony Award winner Scott Pask (Book of Mormon), costume design by Tony Award winner Ann Roth (Shuffle Along) & Matthew Pachtman (Hello, Dolly!, Associate Costume Designer), lighting design by Tony Award winnerNatasha Katz (Frozen), sound design by Tony Award winner Brian Ronan (Mean Girls), wig and hair design by Josh Marquette(Present Laughter), make-up design by Milagros Medina-Cerdeira (Present Laughter), orchestrations by Tony Award winner Larry Hochman (Hello, Dolly! ), additional orchestrations by John Clancy (Mean Girls), music supervision by Mary-Mitchell Campbell (Mean Girls), music direction by Meg Zervoulis (Mean Girls), music arrangements by Glen Kelly (Mean Girls), vocal arrangements by Matthew Sklar and Mary-Mitchell Campbell and casting by Telsey + Co./Bethany Knox. THE PROM is based on an original concept by Jack Viertel. 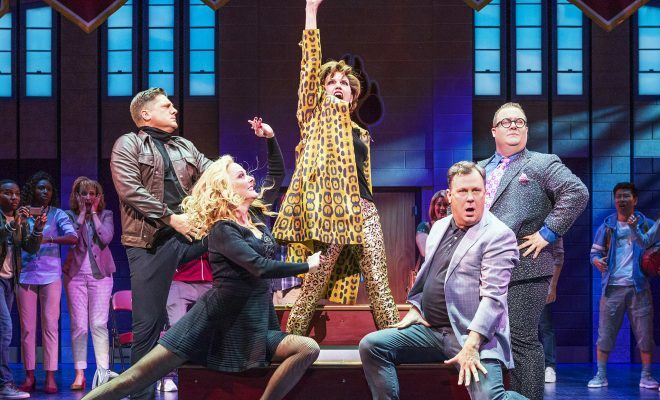 Follow THE PROM on Instagram and Twitter at @ThePromMusical and on Facebook athttps://www.facebook.com/ThePromMusical/.